Tank sections manufactured under ASME-certified conditions were assembled at a riverside site. 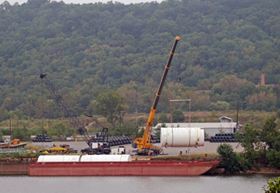 The tanks were loaded on a barge for transport on the Ohio and Mississippi Rivers to the Gulf of Mexico. For their final journey, the composite tanks were transferred to an ocean-going vessel at a Gulf of Mexico port. RL Industries Inc, a manufacturer of corrosion resistant composite equipment based in Fairfield, Ohio, USA, manufactured three large composite tanks to store a 32% solution of hydrogen chloride (HCl) or a 20% solution of sodium hydroxide (NaOH). All three tanks are 20 ft (6.1 m) in diameter. One tank is 47.7 ft (14.5 m) high and the two other tanks are 41.3 ft (12.6 m) high. The tanks were engineered for 8 inches (+20 mbarg) positive pressure and 1.2 inches of water (10 mbarg) negative pressure. The design temperature is 194°F (90° C). The contract also called for two 7 ft diameter by 16 ft high (2.1 m by 4.9 m) shop-fabricated tanks for holding non-potable water for emergency safety showers. To keep ambient Saudi temperatures from making the water too hot, these tanks have 2 inches (5 cm) of sprayed urethane foam insulation encapsulated within the laminate. To resist the highly acidic nature of the storage media, the tanks were manufactured using Vipel® F010 bisphenol A epoxy vinyl ester resin from AOC, headquartered in Collierville, Tennessee, USA. To produce the tanks, RL Industries first filament wound cylindrical sections using Vipel resin-impregnated glass fibre roving. Winding was accomplished over a high performance corrosion barrier, formed with chopped strand mat and two layers of carbon veil in the Vipel resin matrix. Nozzles and attachments for ladders and rails were integrated into the wound sections. To mould top and bottom end closures, the Vipel resin was vacuum-infused through glass fibre reinforcements and structural sandwich core. For enhanced load-bearing, RL Industries designed the bottom end closure with an integral, high-strength knuckle radius. The top and bottom end closures were integrated into the cylindrical shell during the winding process. RL Industries engineering manager Brian Linnemann explains why Vipel resin technology was specified for all the work. After the tank sections were manufactured, they were assembled at a site 20 miles away. Special permits were obtained to ship the tank sections over the road to the assembly site. 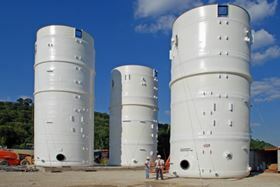 At the assembly site, the cylindrical sections were sequentially assembled using laminating techniques that are similar to the way chimney liner 'can' sections are joined. The end-result for each tank was a high-strength, monolithic structure ready to work when installed. After all tanks passed hydro-testing protocols, they were loaded on a barge for transport down the Ohio and Mississippi Rivers to a Gulf of Mexico port. 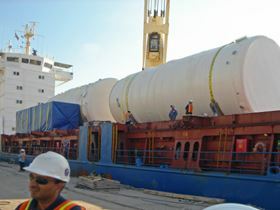 The equipment was then transferred to an ocean-going vessel for shipment to Saudi Arabia. Compared to on-site fabrication in Saudi Arabia, RL Industries’ dedicated manufacturing facilities eliminated the potential for ambient contamination and provided better control of process parameters. The company’s manufacturing is also certified to American Society of Mechanical Engineers (ASME) standards for corrosion-resistant structures. The composite vessels that RL Industries builds meet the ASME RTP-1 standard and Section X of the ASME National Boiler and Pressure Vessel Code.